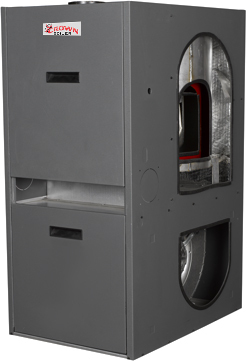 The Hiboy Shorty Furnace is a residential, oil-fired warm air furnace. The Hiboy Shorty is designed for use with a conventional chimney; an optional direct sidewall vent kit is available when utilizing a chimney is not practical. The Hiboy Shorty also comes with an air conditioning ready fan control center, with conveniently located, color-coded wiring. The furnace also includes a washable air filter, as well as a heavy duty heat exchanger, manufactured from precision-made 16 gauge sheet steel, 100% welded and quality tested to last a lifetime. Options on the Hiboy Shorty consist of an available ECM motor and your choice of four different oil burners: Beckett AFG, Beckett NX, Carlin or Riello. When used with the Beckett NX burner, the Hiboy Shorty is ENERGY STAR® qualified.See the Product Ratings tab for more details. The Hiboy Shorty can also be paired with air conditioning cased coils up to 4 tons. The Hiboy Shorty is over a foot shorter than our standard Hiboy, making it ideal for installations where vertical clearance is limited.